Kirkcaldy Carpet Cleaning is a Kirkcaldy, Fife based carpet cleaning business providing a professional carpet and upholstery cleaning service thoughout Kirkcaldy and most towns and villages in fife. Our Kirkcaldy technicians are fully trained and are available for both daytime and evening appointments to ensure we can work round our customers needs. Just give us a call to discuss your requirements. 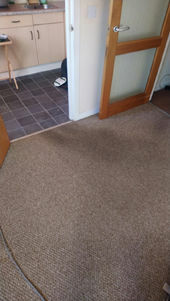 This is a photo of a Carpet Cleaning Job we done in Kirkcaldy. Doorways are always dirty and we have cleaned to the left hand side of it and taken a photo to show the contrast between the clean and dirty area. 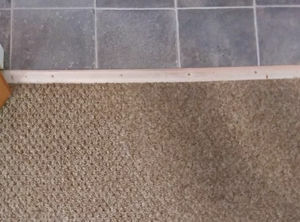 This is the result that can be achieved with our carpet cleaning system. This photo shows the wider area that has been cleaned. 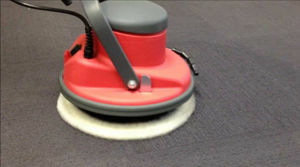 The system used is a low moisture cleaning system so the carpets are ready to use straight away. We have been Cleaning carpets in Kirkcaldy for both residential and commercial clients for many years now and are always happy to have new customers book our services. We use a wide range of carpet cleaning machines and solutions so we have the right equipment to deal with any carpet cleaning job required. We also clean carpets thoughout fife so if you are not in Kirkcaldy and require a carpet cleaning service feel free to call us to let us know your requirements. We are always happy to travel to clean carpets. Kirkcaldy Carpet Cleaners - We are considered to be one of the best Carpet Cleaning businesses in the Fife area. Most of our customers are in Kirkcaldy, Dunfermline and Glenrothes though we do cover all other towns close to these areas. We employ only the best carpet cleaning technicians and use only the very best carpet cleaning machines and solutions to ensure our customers carpets are cleaned to the highest standard possible. Our prices are very competitive and the price you are quoted is the price you can expect to pay as there are no hidden charges like many carpet cleaning businesses have.